Magento has long held the position of being the most popular ecommerce platform, commanding 29.1% of the total market share in March 2016. But after the launch of Shopify Plus in 2014, a lot of larger brands started jumping ship. And since Magento announced that their old sites would stop receiving updates in 2020, the competition between Magento and Shopify Plus has become fiercer than ever. So, which platform is better for you? As with most big decisions, the answer isn’t clear-cut. There are a whole host of factors to consider, which we’ve laid out here in jargon-free English for you. Grab a cup of tea, a biscuit and your comfiest chair, and settle down to read our thoughts on the whole Magento 2 vs Shopify Plus debacle. Psst: Short on time or attention span? Get in touch and we’ll give you the lowdown. Shopify Plus is a software as a service (SaaS), which means it comes fully hosted, running on somebody else’s server. SaaS is becoming an increasingly popular alternative to self-hosted software, with more and more companies moving from traditional software to web-based subscription models. One of the main benefits of SaaS is that your site’s security is the responsibility of your provider. Shopify takes care of everything from SSL certificates to PCI compliance and security patches, so you won’t have to lie awake at night worrying about your site’s security. These automatic updates also mean you won’t have to waste development resources on manual site updates. It’s like having a car that updates itself – you never have to spend time taking it to the garage to swap it for the latest model. SaaS is also a lot quicker to deploy than self-hosted software. With no installations required, a Shopify Plus site is likely to be a lot quicker to build and deploy than a Magento 2 store, saving you a huge amount on project fees. Because Shopify’s $2000 monthly licensing fee includes the cost of hosting, the SaaS model saves you from a host of additional costs. This fee also includes 24/7 support from the Shopify team, so you’re covered if your site runs into any technical issues. And by cutting out the need for a third-party hosting provider, you’ll have fewer points of contact if anything does go wrong. Unlike Shopify Plus, Magento is self-hosted. That means you’ll either need a third party to host your website or you’ll need to host it yourself. Hosting Magento requires a robust server, which can result in astronomical operation charges. It also means you’ll be responsible for any downtime or technical issues your site experiences. That’s why most companies using Magento opt for a third party to host their website, which costs around $1000 a month on top of Magento’s $22,000 annual fee. One of the downsides of having a self-hosted platform is that you’re entirely responsible for your site’s security. All updates and security patches have to be installed manually, which often requires development resources and adds to your monthly cost. To win back some of their clients from Shopify, Magento recently released a fully-hosted version of their software: Magento Commerce Cloud. Similarly to Shopify Plus, Magento Commerce Cloud gives you automatic security updates and performance improvements. But because it’s much newer than Shopify Plus, it’s less refined and hasn’t been widely tested. It’s also a lot pricier than Shopify Plus, with the cloud version coming in at $3333 minimum in monthly costs. If you’ve got your heart set on Magento, you’re better off with the cheaper self-hosted version. While some businesses prefer the flexibility and control of a self-hosted platform, it can be a lot of work and create unmanageable costs. If you’re looking for an easy-to-manage site and a smaller monthly bill, go for Shopify Plus. Shopify is one of the easiest ecommerce platforms to use on an everyday basis. Designed with retailers in mind, the backend features a simple drag and drop editing functionality. Customising the homepage, editing the navigation and changing the typography can all be done with a few clicks. Although Shopify Plus and Magento 2 have a lot of features in common, Shopify simplifies them for day-to-day use. With no need for a developer to access the site and make basic changes, you can save your agency resources for more exciting stuff like bespoke features and animation. With built-in tutorials for new users, Shopify does everything in its power to make the backend simple to use. Working on a ‘what you see is what you get’ basis, there’s no need to access the HTML or CSS when you want to make changes. If you’re willing to take a quick tutorial and get familiar with the backend, you can run your whole site without ever needing to talk to a developer. Not only is Magento a lot more difficult to set up, but it’s also harder to use on an everyday basis. Unlike Shopify Plus, it has an incredibly steep learning curve. Unless you’re a backend developer, you’ll find it difficult to go into Magento and make simple changes to your theme. Although Magento has a lot more unique features than Shopify, you’ll need advanced knowledge to be able to utilise them. With no drag and drop functionality or visual editor, even customising the homepage or navigation becomes a complicated task. If you’re tech-savvy and fluent in code, this won’t be too much of a problem. But if you’re looking for a platform that’s easy for you and your staff to get to grips with, Magento isn’t for you. With the international ecommerce industry worth $30 trillion, how you sell globally should be one of the first things you think about when choosing a platform. Do you want localised stores for different countries? Or would you rather sell worldwide through your main site? Your plan for internationalisation could be the deciding factor between Magento 2 and Shopify Plus. One of Magento’s key selling points is that it allows you to manage multiple stores from a single interface, allowing you to have different sites for different countries. With localised domains, languages and currencies, your international customers can enjoy a better shopping experience. This multi-store functionality means you can share product catalogues across your different stores, with the option to apply changes across all your sites (like adding a new product) or just one store view (like amending the price). For this reason, Magento 2 is a popular choice for international brands. Magento’s multi-store architecture also makes it a popular choice with multi-brands like Virgin and Nestlé. Companies with dozens of brands sitting under them benefit from Magento’s ability to manage stores from a single interface, which makes data syncing and product updates a whole lot easier. Shopify Plus allows you to create up to 10 different store views, but unlike Magento, they have to be on different interfaces. You’ll need an interface for each different store you create, which can get exceedingly complicated. You can share data between the stores using content syncing apps and project information management systems, but it requires a lot more work than it does with Magento. So, if you’ve got your heart set on having different stores, Magento 2 is your best bet – for now, anyway. Of course, you can also sell globally through one Shopify Plus store – you don’t need to create localised storefronts. Real-time exchange rate data means your Shopify site can show prices in multiple currencies, but these prices will revert to your main currency at the checkout. Although this isn’t a great customer experience, it’s an easy way to sell internationally. If managing multiple stores isn’t part of your game plan, then Shopify Plus is a great choice. Shopify Plus is currently working on a multi-store architecture to rival Magento’s, which is due to be released at the end of 2019. After that, the competition between the two platforms will become even tighter. Shopify Plus has a flat monthly licensing fee of $2000, which includes hosting, unlimited staff accounts and 24/7 phone and live-chat support. This fee is capped at $800,000 orders a month, so if your business exceeds that order volume, you’ll have to pay a higher rate. Because it’s much quicker to build and deploy, a Shopify Plus site is also cheaper to build than a Magento store. And with agencies charging by the hour, a faster project is going to cost you a lot less. A Magento 2 site is likely to cost you closer to £100,000, depending on the complexity, while you can get a great Shopify Plus site for less than £50,000. Magento charge an annual fee of $22,000, making it similar in upfront costs to Shopify Plus. But because this price doesn’t include hosting, you’re actual annual fee is likely to be a lot higher than that. The minimum you can expect to pay for both Magento and third-party hosting is $3000 a month. For Magento Commerce Cloud, which includes licensing and hosting, your monthly fee is likely to be around the $3500 mark. Whichever version of Magento you go for, you’ll also need to pay a development team or an agency to maintain your site. Because it’s quick to deploy and requires less maintenance to keep it running, Shopify Plus ends up being considerably cheaper than both the self-hosted Magento platform and Magento Commerce Cloud. So, if you’re looking to increase your profit margin, Shopify Plus is the way to go. Although neither platform excels at reporting, Magento 2 has the edge – but it comes at a cost. Magento customers can opt for Magento BI, a cloud-based subscription that gives detailed reports through a customisable dashboard. 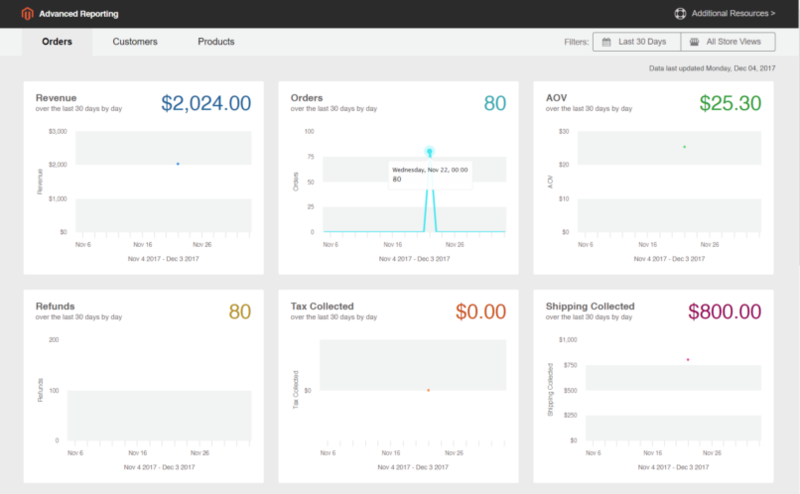 Magento BI can also bring in data from your other reporting systems, such as Google Analytics or your ERP. Setting you back anywhere between $100 and $2000 a month, Magento BI won’t be a feasible option for anyone on a budget. Most businesses will be better off using Magento’s free ‘Advanced Reporting’, which gives you eight detailed sales reports. You can also opt for an in-depth reporting tool like Aheadworks or Jet Global. While Magento’s paid reporting subscription has the edge, Shopify Plus wins for their detailed free reports. As part of your Shopify Plus monthly fee, you get access to 13 detailed sales reports, five more than you get with Magento. 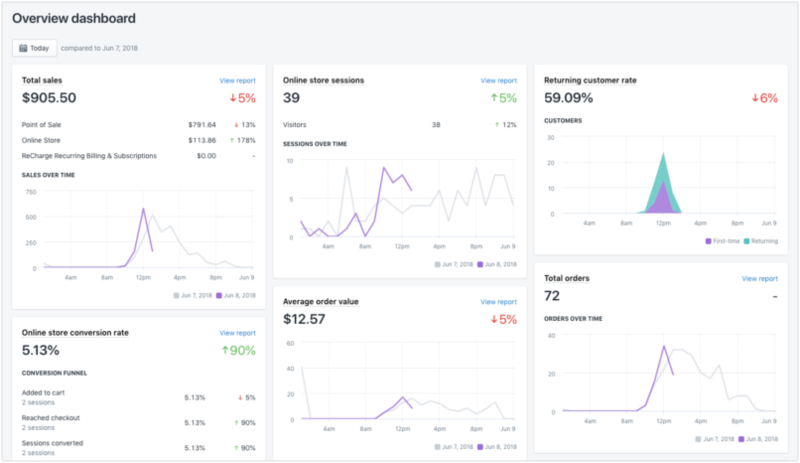 Although there isn’t the option to upgrade Shopify’s reporting, there are numerous reporting tools you can use for more detailed analytics, such as Littledata and Elevar. Support is where Shopify Plus comes into its own as a platform. As well as online forums and a help centre, Shopify Plus clients get access to 24/7 support through phone, email and Live Chat. Each retailer is also assigned a Merchant Success Manager, providing brands with ongoing personalised support. Plus, because Shopify handles updates and security for you, you’re less likely to have to access support in the first place. All Magento customers get tech resources, forums and guides, as well as access to 24/7 phone support. Cloud customers can also get assistance from Magento’s account management team, but this comes at an extra cost. For self-hosted Magento customers, most of your support queries will need to go through your hosting provider, which can complicate things. Unlike Shopify Plus, which charges a flat fee, the speed at which Magento fixes your problems depends on the price of your plan. Commerce Cloud has two pricing options: Gold and Platinum. For Platinum clients, you can get a response to critical issues within two hours. For Gold, you’ll have to wait up to four hours. With a dedicated Success Manager assigned to you at no extra cost, Shopify Plus is hands down the best platform for ongoing support. If you’re using a self-hosted edition of Magento, Shopify Plus is always going to win for site security. By default, all Shopify Plus sites are Level 1 PCI compliant. Shopify also does annual on-site compliance assessments and continuous risk management to make sure their security stays up to scratch. With Magento, PCI compliance and security updates fall on your shoulders. If you’re using a third-party hosting provider, you’ll need to ensure they meet your site’s security needs. To make sure your customers’ data stays safe, you’ll also need to stay on top of security updates and patches. Although both platforms have well-established marketplaces, the Shopify App Store is more extensive than Magento’s. With over 1000 apps for an unimaginable number of functions, Shopify can be easily customised to create your ideal store. Shopify also enforces tight quality controls on all their third-party apps, ensuring quality for clients. Although you can’t change the core functionality of Shopify apps, they can be customised to fit your site’s theme. And because they’re hosted by a third-party, you don’t have to worry about keeping the app up to date. 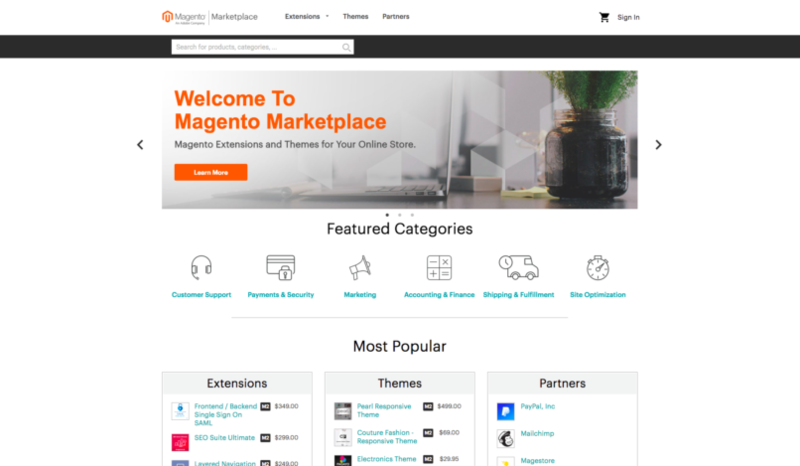 Although Magento’s marketplace isn’t as extensive, the apps can be endlessly customised – but this comes with plenty of downsides. Amending your codebase requires a lot of pricey development hours, and is much more likely to lead to problems on your site. With Shopify’s wide selection of robust apps, you won’t need to access the codebase. 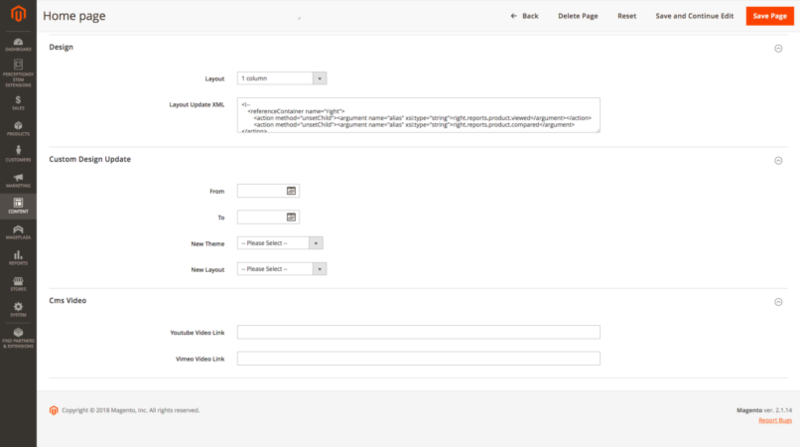 If you’re using the self-hosted version of Magento Enterprise, you have unlimited customisability. With access to your site’s source code for the platform, you can modify and build upon your site in any way that takes your fancy. Without access to this code, you’re stuck with the site’s core functionalities. If you have an in-house development team or an unlimited budget for agencies, opting for an open-source platform might be the best option. Magento has an extensive community of developers committed to extending the platform in any way you can imagine. If you’re willing to pay for their time, there’s no limit to what you can do with Magento. However, amending your site’s source code means giving someone access to the bones of your website. Not only does this present a huge security risk, but it makes it more likely for technical problems to crop up in the future. It’s also worth mentioning that you won’t have access to your source code with Magento Commerce Cloud, so if you’re looking for flexibility, go for the self-hosted Magento Enterprise platform. Because Shopify Plus is a hosted platform, users don’t have access to their store’s codebase or database. While this means you don’t have to worry about keeping the code up to date, it also means you have less control over your platform. You’re stuck with the site’s core structure. However, although you’ll be limited in what changes you can make, you also don’t have to worry about putting your site’s structure in the hands of agencies and freelancers. Shopify Plus takes complete responsibility for your source code, which means you’re far less likely to run into technical issues caused by coding. If you don’t have an in-house development team or an enormous budget, Shopify Plus is still your best bet. But if you’re after complex functionalities and endless customisation, a self-hosted platform might be for you. Although Magento 2 is a powerful platform with unlimited flexibility, our overall winner has to be Shopify Plus. 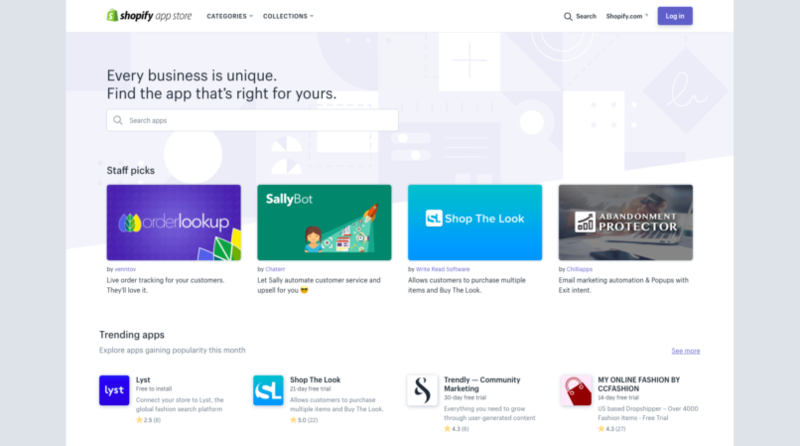 Shopify Plus is cheaper to build, requires a lot less maintenance and has thousands of customisable apps to extend your site. And, more importantly, it makes our clients happy – which is what we care about most. Less backend work and quicker deployments mean we have more time to make our clients’ sites look incredible. And, when it comes down to it, we’d rather be wowing clients than fixing bugs and installing patches. But Magento 2 is still a great choice, especially when it comes to creating multiple international storefronts. So, if that’s what you’re looking for, we’d be happy to help with that too. Our team includes both Magento certified developers and Shopify Plus experts. Whatever you need, we’re here to help. 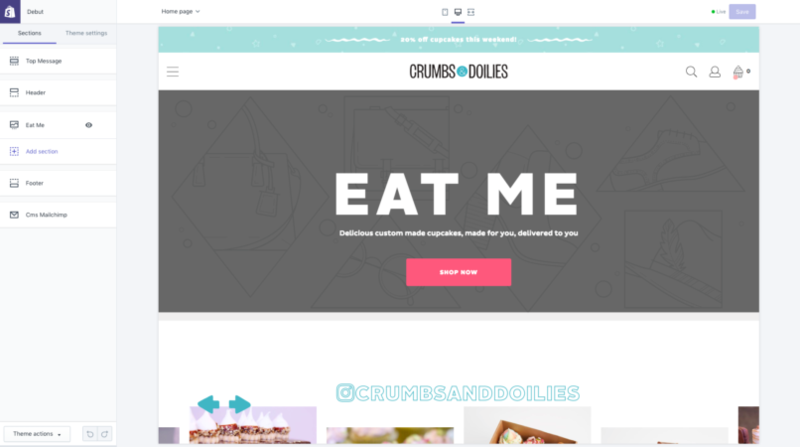 To find out more about which ecommerce platform is best for your business, or to talk about an upcoming project, get in touch here.